Over two years ago, someone remarked, "How many author birthdays can there be? Won't you eventually run out of ones to celebrate?" I replied, without really knowing, "I think I will have plenty of birthdays to celebrate." Now, two years later, I learn the birthdays of authors and illustrators in so many ways. I meet an author at a book signing and ask them, without sounding too creepy, "Would you be interested in sharing your birthday? My family has been celebrating author birthdays for two and half years." Sometimes, I receive emails from authors and illustrators offering their birthday to me for a celebration -- which I actually do not mind, but am careful not to make guarantees. Also, I have become friends with many authors locally and online (and it is not as hard to ask a friend for their birthday!). I feel very blessed to have shared a special day with so many people. Today, I am pleased to introduce you to my friend, fellow parishioner, the coordinator of my writing critique group, and one of most tech-savvy grandmas I know. Mary C. Ryan has published nine novels for young readers. Her writing career began when she was a mom of six children. She would "stay up late and bang away at an old manual typewriter while the rest of the family slept." (m-c-ryan.com). She landed a job as a correspondent newspaper reporter and later sold her first freelance piece, a poem, to the Wall Street Journal for whopping $5! The "highlight of her career" was when her novel, Me Two, was made into a movie, The Other Me, by the Disney Channel (see the YouTube video below.) Mary moved into self-publishing with her novel The Secret in the West Woods. She chose to self-publish this book because, "I sensed right away that it would be just be an exercise in futility for me to peddle it to the big houses because it was regional. But, I love books that are set in areas I know and because The West Woods park was just beginning to be developed, I felt there would be a match." (Entropy Plaza). She also also self-published two Christmas books, Twitcher McGee and the Wonderful Tree and The Christmas Dragon and most recently an excellent eBook that I recommend, Helping Ray. 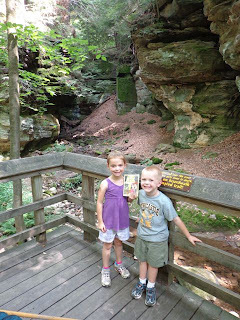 The Secret in the West Woods was the book I chose to focus on for our birthday celebration. I immediately knew that I wanted to take my children to the park that was the setting for this science fiction middle grade novel. The West Woods is located in Geauga County, Ohio. The highlight of a trip to The West Woods is to visit Ansel's Cave which was believed to have "sheltered Civil War soldiers and munitions, runaway slaves on the Underground Railroad, Prohibition-era bootleggers, and Geauga County resident Ansel Savage." (Geauga Park District). The story, In the Secret the West Woods, begins with Danny and his new friend Regan stumbling upon a couple of mysterious artifacts, a coin and something that resembles an old juice can, while hiking near Ansel's Cave. One of these items becomes very important in unlocking the bizarre secret in The West Woods. On our hike I made a Nature Scavenger Hunt activity sheet to encourage my children to search for "natural" artifacts on our 1.6 mile hike. 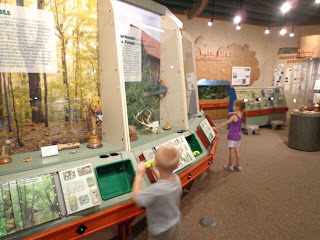 The Nature Scavenger Hunt is available for download. 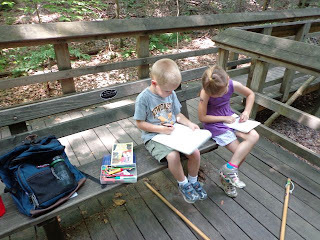 It includes two different versions of the activity -- one is focused on recording your observations by drawing pictures and the other focuses on writing down your observations. 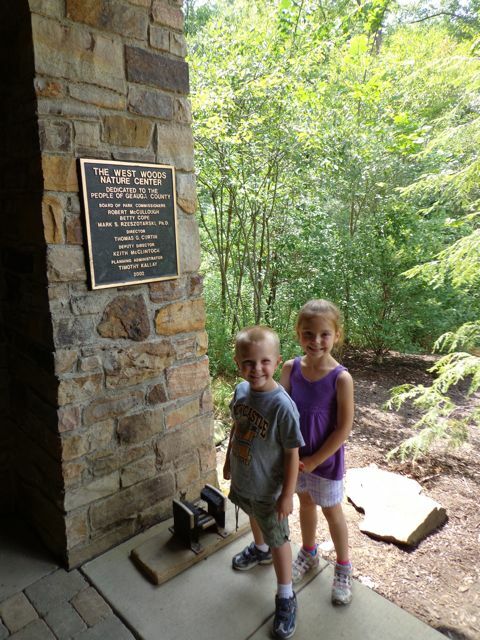 Upon arriving at The West Woods, we were so excited to find that the park had a nature center. My children enjoyed going through the exhibits before our hike. 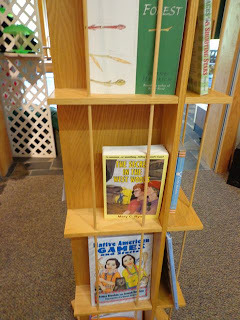 We found Mary C. Ryan's The Secret in the West Woods in the gift shop. 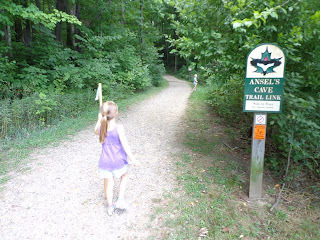 We set out on the Ansel's Cave Trail Link with our hiking sticks in search of Ansel's Cave. 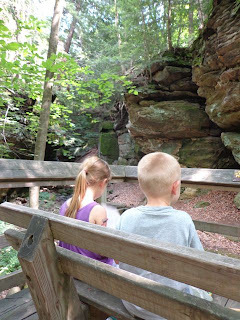 I told my kids that Mary C. Ryan used her imagination to come up with a story about this cave. I challenged my children to draw the cave and something that could live in it. My son drew the cave with a bear. My daughter drew a cave with a GIANT bat. I told them that both of these ideas could easy be made into their own stories. My son elaborated a little and I found out that his bear was not very nice! Yikes! 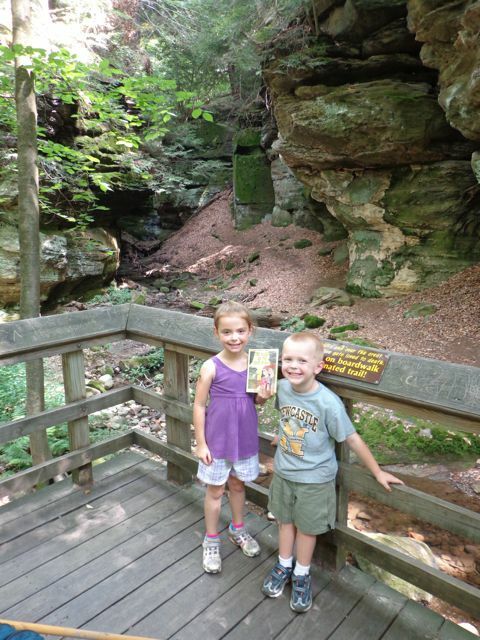 My children and I enjoyed visiting the location that inspired Mary C. Ryan to write her book. We also had a great hike, enjoyed the afternoon together, and successfully completed our Nature Scavenger Hunt. Birthdays were always celebrated in our house. No big parties or lavish gifts, but my mom made sure we had beautiful cakes every year. She was an expert at decorating them with flowers and script. They were always chocolate with 7 Minute Frosting. (If you've ever made that frosting, you'll know that it takes time and a great deal of love!) One of my favorite gifts, when I turned 12, was a record album -- 78 rpm -- of Roy Rogers and the Sons of the Pioneers. Roy was one of my heroes. I haunted movie houses if there were cowboy flicks up. My father despaired that I would ever grow out of that phase. Well, I still love horses, and when I took a train ride through Arizona's Verde Canyon a few years back, I felt like I was home. In recent years, I've tried to downplay birthdays as I feel it only encourages them. Thank you Mary so much for sharing your birthday thoughts. We hope you have a wonderful birthday and see you at writing critique group! 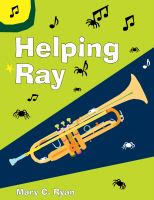 Check out Mary C. Ryan's latest book Helping Ray - available from Smashwords for only $3.99. I really enjoyed this book. Ray is a great character with a supporting cast that really pulls you through the story and wanting to know more. Try out the first couple chapters online at Smashwords and I think you will want to read the whole book. What a wonderful surprise! Happy Birthday, Mary C. Ryan! what a fun visit to the West Woods. I want to be one of your kids! Your blog is inspirational to many young families and I love that you are giving your children such counter-cultural experiences. Your adventure to the West Woods looked awesome - I want to be one of your kids! Your blog is inspirational to many young families. I love that your experiences are so counter-cultural, giving your kids a simple, unencumbered childhood. Bravo to your skills as a writer and a dad! What a wonderful west woods adventure scavenger hunt! Happy Birthday Mary!